This past weekend, we (Ken Kavula, Hugh McManus and Mark Robertson) spent some time with over 200 long-term investors in Chicago at the 63rd Annual Convention for the National Association of Investors (NAIC). If you’ve been around here for a while, you know that we often pay tribute to the likes of Messrs. Nicholson, Graham, Babson, Schloss, O’Hara, Janke, Seger and place/phenomenon called Beardstown here on these pages. We’ll do that again here. But first, a quick reminder about the screening results at the top of the page. This weekly screen was inspired by Irina Clements. In fact, we call it our Irina screen. Every week we present the companies in the current update batch. We do fundamental updates on 1/13th of the companies at Manifest Investing every week using the same cycle as one of our trusted resources, the Value Line Investment Survey. Warren and Peter (we’re on a first name basis with them) both regard Value Line as a veritable and trusted resource. We do too. Irina asked us to collect the top ranked study candidates … and allow us to compare the opinions of Value Line, Morningstar (another formidable and trusted resource) and Standard & Poor’s side-by-side. So we do that. We list our aggregate results next to the three of them. Keep in mind that every company report and equity analysis is as if we put a whole bunch of rhinos in a padded room, including the analysts who collectively form the analyst consensus estimates, and locked the door. They continuously are completing stock selection guide-centered stock studies and continuously generating the results as prices change (daily) and fundamentals (growth, profitability and projected P/E ratios) blow in the wind. We feed them occasionally because we know better than to frustrate or disappoint a Wall Street rhino. 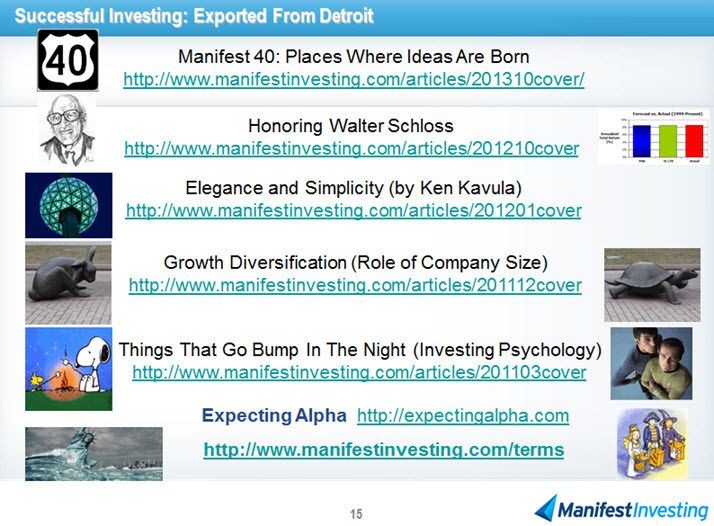 The column on the left provides the ranking within the MANIFEST 40, our listing and tracking portfolio of the forty most widely-followed companies by Manifest Investing subscribers. This week, Intuitive Surgical (#37) and ResMed (#29) are among our community favorites. Teaser: During the current refreshing of the website, Kurt Kowitz will make this listing continuously available on the home page. It may not seem like there’s any order or sequence — but there is. We combine the return forecast (projected annual return) with quality to come up with MANIFEST Rank. The companies on this list are ranked, top to bottom, using this combination characteristic. The figures for Morningstar and S&P are based on their current fair value estimates. A low price (but probably not too low) price-to-fair value ratio suggests potential attractiveness from a return perspective. There’s often a divergence of opinion from stock-to-stock and this week is no exception. Take a look at those ranked high by one agency versus the outlook from the others. This week, there’s a HUGE difference in perspective between Morningstar and S&P on Intuitive Surgical (ISRG). It was every bit a phenomenon. From the cornfields of Illinois came a group of formidable investors who became known as the Beardstown Ladies. Formed in the aftermath of an investing small group first championed by the Business and Professional Women Association, Betty Sinnock and her colleagues transcended brokers who wouldn’t return an investment-related phone call from a WOMAN. Fast forward nearly 30 years and we can literally point to thousands of clubs and likely millions of investors who have been inspired to discover long-term investing. They were nudged by the likes of Doris Edwards (a persistent school teacher who gives me another book to read nearly every time I see her) and Maxine Edwards and now, a new generation of Beardstown. Betty Sinnock accepted the Nicholson lifetime achievement award on behalf of Beardstown and the legions they’ve inspired over the decades. Promises kept. Indeed. For more, here’s my report, Thanksgiving 2010 – Of Heroes & Harvests from a fairly recent trip to attend one of their club meetings — which are still often open to the public. Did I mention they have a section in a museum dedicated to their exploits and adventures? Speaking of Beardstown, it’s one of the communities on Route 66. Last year, we took a spin down Route 66 stopping at places like Springfield (IL), St. Louis and Oklahoma City. One of the beaming faces at the end of the road in Oklahoma City, home of the Heart of Oklahoma chapter for NAIC was Irene Jondahl. Irene has been serving investors, building programs, assisting her colleagues and inspiring the seekers in their quest to discover successful long-term investing. Irene was honored with one of the awards for excellence in volunteerism. Irene is a blessing and a gift to all of us. A few miles to the east in Cincinnati, there’s a team of volunteers in southern Ohio nestled in a hotbed of interest (and success) in building programs and PORTFOLIOS. It’s a machine. And reliable machines are often held together by the best fasteners, glue and duct tape. In this case, the Oki-Tri State has benefited from a lineage of leaders, and Linda Miller has been there nudging them along for over 25 years. Linda Miller accepted this year’s lifetime achievement award for excellence in volunteer leadership. The award is named for Ken “Mr. NAIC” Janke. I’m sure Ken is smiling about Linda’s exploits and achievements. Last but far from least, we come to Ralph Seger. Ralph passed away during May 2014 and will always be remembered for his contributions to Better Investing, decades of stock selection and for the Repair Shop in the publication for years. His friends knew him as Captain Blunt. Because he was. He was a grumpy old man — probably since the age of 10. But with a heart of gold. When I joined the NAIC team back in the 1990s, Ralph welcomed me with open arms and helped me learn long-term investing up, close and personal. We shared literally hundreds of breakfasts, lunches and dinners. I will treasure them all. It had been a couple of years since we last had lunch. I regret that. But I don’t regret the group dinner we attended at his retirement residence with his friends the Dankos and Sobols and our spouses. When I learned of his passing, I did a [Search] for “Seger” on Manifest Investing. Ralph made a solitary post on our Forum back in July 2008. You can check out the sage and timely and timeless comment that he made here. Bottom line? Ralph was duly concerned — with a duly amount of grumpy wisdom about conditions in the banking industry. We can now look back and appreciate that within a few months, he nailed it. Ralph was featured in a Better Investing cover story, highlighting his frequent sage advice … and a lifetime of generosity to a community of long-term investors. Thanks, Ralph — we couldn’t be doing this now and going forward — without you. The average Value Line low total return forecast is now 4.2%, up from 4.1% last week. As the Better Investing long-term investing community celebrates its 63rd annual convention, here are some shopping ideas for stock studies. The following high-quality stocks have outsized return forecasts as featured on the Stocks page today at www.manifestinvesting.com. As featured in our cover story for May (2014), this screening for non-core stocks was inspired by our repeat group champion in our annual stockpicking contest, The Broad Assets Investment Club of St. Louis. Their selection of Lannett (LCI) tripled in 2012 and tripled AGAIN in 2013. This listing attempts to identify companies with breakout earnings (early stage in their life cycle) with outsized earnings forecasts for 2014 and 2015. These are the top percentile stocks based on a combination ranking of return forecast (PAR) and quality — and not limited to median return forecast (MIPAR) plus ten percentage points.